Welcome to Evergreen Nursery! If you've been searching the internet for an "online" or "mail order" supplier for high quality, nursery grown trees, shrubs, flowering plants, and berries.............then GOOD NEWS!! Look no further. Feel free to browse our extensive collection at your leisure, knowing that all plants are of top quality, and shipped in a manner that results in your order arriving in tip top shape, and ready to settle into their new home. We are a family owned nursery with an emphasis on providing a very diverse variety of plants that we feel all have very desirable traits that can enhance just about any home landscape, or garden area. We feel that our combination of selection & quality, along with very reasonable prices simply can't be beat. Our steady growth year after year of loyal, repeat customers speaks volumes as to the combination of value, wide selection, and quality that we continue to offer our customers each & every season. So take some time to look through the various categories we offer - we truly hope that you will give us the opportunity to help you with your planting needs this year. We would love to add YOU to that ever-growing list of repeat customers!! We definitely couldn't have come close to the successful year we were able to have in 2017 without one main driving force that keeps our nursery growing year after year. And that is YOU - the customer!! To our high percentage of loyal repeat customers, we cannot possibly say "THANK YOU" enough - almost half of our order volume in 2018 came from repeat customers, which is an amazingly high number in any type of business. Your repeated business tells us that we're doing things the right way, and treating our customers right. To those new customers who decided to give our nursery a try this past year, we also say "THANK YOU".......and hope that we will have the opportunity to continue to serve your planting needs in the future. With a fairly mild winter, we anticipate having very good numbers of most crops available beginning in spring, and hopefully lasting throughout the entire summer & fall seasons as well. Some varieties are ready at this time for purchase & shipment - while others are not shipped until they emerge from winter dormancy, or until the early new spring crops are actually ready to go. We encourage early ordering whenever possible, as the chances of certain varieties selling out each spring is inevitable. Another very common occurrence each spring is a slight shipping delay period which tends to occur at the very peak of the busy spring ordering / planting season. There have been several improvements made to our shipping facilities - including a new packing & shipping building with increased capacity to help handle the increasing order volume we have experienced over the past few years. We always do our very, very best to get all orders out as quickly as humanly possible - but there is almost always a brief period where we simply receive orders at a rate faster than we can physically ship them out. But with a little patience, everyone usually gets their order in a very timely manner. We have managed to keep the vast majority of our prices unchanged over the past several years, despite the constantly rising prices of various aspects of doing business. We are glad to say that we still have no plans to have any across the board price increases - but unfortunately there will be a few areas that will see some minor increases. Most of the price increases will be as a result of a general movement from within the nursery industry to have new, "branded" & "trademarked" varieties of many species that are now being grown & developed. While these new varieties are absolutely outstanding plants, and well worth the price that we offer them to you for.........they are a little more expensive than some of the older, more traditional varieties that have been around for years & years. This is due to royalty fees that the patent owners of these new varieties are beginning to charge all nurseries and growers in order to grow, market, and sell the new varieties under their trademarked names. We really have no choice but to pass these royalty fees we are charged along to the customer - and they are all included in the price you see on our website. The remainder of the price increases are pretty much a result of the slowly accumulating increases in the costs of shipping supplies, licenses, certifications, even right on down to the soil itself!! While we continue to offer our customers a large variety of traditional favorites that have stood the test of time, we also continue to test, evaluate, and offer, some of the newest varieties being developed in most all categories. Starting a couple years ago, we introduced a "Newest Intros / In The Works" page, which groups together a listing of most all of the newer varieties we have planned for introduction this year. These new varieties are planned for introduction at various times throughout the year - some are already available, while others are still "in the works" and in various stages of production. Feel free to check out this page to get an idea of what is new & ready to go.....as well as what might be coming on down the line as the year progresses. Here at Evergreen Nursery, we specialize in an extensive variety of evergreen trees and shrubs. Arborvitae ( Thuja ), Juniper, Cypress, Holly ( Ilex ), Chamaecyparis, and Cryptomeria are just a few of the many evergreen species that we offer. We also have many varieties of coniferous evergreen trees, such as Spruce, Fir, Cedar, Hemlock, and Pine. But just because we specialize in evergreens doesn't mean that is all we have to offer - far from it!! Throughout our website you will find a very large selection of many other trees & shrubs - some evergreen, some deciduous.....some that flower, and others that are grown for their brilliant foliage. Crape Myrtle, Drift Roses, Boxwood, Euonymus, Spirea, Weigela, Daylilies, and Nandina to name a few - but that just scratches the surface. We even offer a nice variety of Ornamental Grasses that are perfect for most any landscape to add a contrast in texture, or give a colorful, natural touch to a particular area. Every single variety we offer is of top quality, and is nursery grown from start to finish in containers right here at our nursery. We take great pride in our nursery, and put in a lot of hard work in hopes of providing you with the absolute best plant for the money.......anywhere! We are also very proud to be involved in taking the extra steps to be as environmentally friendly.....or "green" as everyone likes to say......in our growing processes. Everything from using recycled paper to print out orders, invoices, etc. 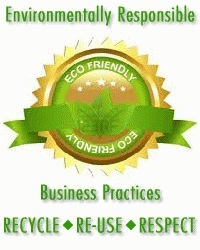 - to using heavy duty second hand / recycled boxes for shipping. We even recycle & re-use all of our plant containers - keeps the plastic out of our landfills!! We are always looking at ways to further decrease the carbon footprint our nursery leaves on our earth. We refrain from the use of harmful pesticides, and chemicals.....unless absolutely necessary, and even try to offer a couple bio friendly products for our customers to use along with their newly purchased trees, shrubs, etc. Products such as the Espoma line of Organic Plant Foods, and Soil Moist water retaining granules will help our customers feed & water their newly arrived plants, and get them off to great start!! And all without the use of harsh chemicals. Each variety & size in our inventory is listed on our website with its own dedicated page for you to review - complete with descriptions, photos, sun & soil preferences, average plant shipping sizes, and much more. In looking through our selections you are sure to recognize many traditional favorites, as well as many varieties that are very unusual or hard to find. We encourage you to take your time to look through our entire variety of different trees, shrubs, grasses, daylilies, and much, much more. You just might find that special something you've been looking for. Many customers choose to place orders for their upcoming spring planting needs during winter months. Although we do still ship the majority of our evergreen selections year round, we will gladly hold & reserve your order until whatever shipping time you prefer - just let us know if you would like your order held until a later date. We definitely encourage early ordering, as things can get pretty hectic as the spring ordering rush gets cranked up. We try our very best to have more than adequate inventory on as many varieties as possible, but each spring certain varieties are bound to sell out as the very busy spring planting season arrives. By ordering early, you are able to beat the spring rush, and are guaranteed to receive exactly what you need. The plants are taken directly out of our available inventory, and are pulled & reserved exclusively for your order. We also have no minimum order - one plant, or one hundred plants - doesn't matter. Orders large or small, we treat them all with the same importance and professional service we feel you deserve. 1) Review, and select the plant varieties you wish to order from all varieties that are listed as "In Stock & Currently Shipping", or "In Stock", with an estimated availability time ( for example, Available for early order - Shipment after 3/25/18 ). Unfortunately, we do not pre-sell, or reserve stock from any crops which are listed as "Currently sold out", or "Available at a later date"..........as those items do not have an estimated, or expected, date that we will have additional crops available for shipment yet. 2) Place your order through our easy, convenient checkout process as usual. There will be an Order Notes section provided for you to leave any special delayed shipping instructions, etc. 3) If you wish to have your order shipped at a later, or preferred time, be sure to either send us an e-mail which states your desired shipping time for the order or be sure to provide this information to us in the Order Notes section when placing your order. For example - late March, mid-April, etc.....whatever time frame you feel is best for your area & situation. This step is VERY, VERY important!! If we are not informed of a later desired shipping time, then the order will be prepared for shipment at the current time. So be sure to let us know of your delayed shipping preference, ok? 4) That's it - we will take it from there! We will send you e-mail confirmation as to your desired shipping time, and will be more than happy to adjust your scheduled shipping time in the event there are changes in your planting schedule. Just let us know if things change, the more notice, the better of course - but we will always try & do everything we can to schedule shipment at the most convenient time for you. Obviously, we cannot ship any order which contains items which have later estimated availability times until such a time that those items are ready for shipment. 5) We will always hold order shipment until all items/varieties ordered are available. All orders will be shipped at one time, and as one complete shipment to avoid additional shipping charges that would result from shipping multiple shipments at different times. We will make every effort to ship orders out as close to the requested shipping time that our customers might desire.......but also cannot absorb additional shipping costs involved with shipping partial orders at various times. So, if your order contains items that are not planned to be available for shipment until a certain date/time, then please understand that your order would not be able to be shipped until that item becomes available. The listed estimated availability times are just that - estimates. But these estimates are usually very close & accurate. Another service we offer that may interest some customers is our Stock Notification List. If you find certain varieties that are currently unavailable or sold out, but you are especially interested in purchasing them when they do become available, please feel free to email us at evergreennursery@charter.net. We will be more than happy to put you on the Stock Notification list for each variety that you are interested in. You will then be notified via e-mail the moment the upcoming crop is ready to go for that variety, giving you a great opportunity to purchase whatever you may need from the new crop before they are gone. The vast majority of our plants are available for shipment year round, with their rootball & soil still intact - NO BARE ROOT SHIPPING. Our shipping methods have proven to be very easy on our plants - the result being that you can expect to receive plants that are not stressed, dehydrated, or destined to slip into transplant shock upon planting. For complete details about our unique shipping methods, we suggest that you check out our Shipping / Packing Procedures page on this site. We realize that many customers may not exactly be familiar with the shipment of live plants, nor with the different shipping options that are available to them. So we have taken extra steps to make the whole shipping end of placing an order amazingly simple & easy. Once an order is placed, you can even track it's progress right here from our website - once again with live, real time updates straight from UPS. We have teamed up with UPS as our exclusive shipping provider. UPS has shown themselves to be able to provide us with affordable rates, shortest transit times, and coast to coast coverage year after year. UPS is also adding in the great feature of Saturday delivery option s for some areas of the country ( with more to come throughout the year ). With UPS, you really do get an unbeatable combination of reliability, economy, and speed. Our shopping cart / checkout area is equipped with a live, real time shipping rate feed directly from UPS - no estimating, flat rate, or percentage based shipping calculations to mess with. All UPS shipping options ( Ground, 3 Day Select, etc ) are all clearly displayed for you to review & choose from BEFORE you ever actually decide to place an order. After reviewing the different shipping options, choose the one that works best for you - then you can go ahead with placing your order. Or, if you do not like the options & charges you are shown, simply empty your cart.....no harm done! There are several nurseries out there these days that offer "free shipping"......but beware. Take a look at their plant prices first. Most of the establishments that advertise "free shipping" will charge much higher prices for the plants themselves, which more than makes up for the cost of shipping them to you. In the end, we feel that our combination of quality, selection, price, and service make shopping with our nursery the best deal around for your planting needs - even after you factor in shipping charges. We are happy to offer our customers gift certificates, which are also available right here at evergreenplantnursery.com as well. Gift certificates are an excellent idea to give as a gift to those gardening enthusiasts or "plant nuts", as we like to call them. Especially in cases where you may not be sure as to just what variety or size of plant someone might enjoy most. Our gift certificates are available in any amount - totally up to you! You can even choose between having a printable gift certificate e-mailed to you, or have us print it out & mail it for you. To learn more about purchasing gift certificates, simply click on the Gift Certificates button located in the main menu on the left hand side of this page. We are a family owned nursery located in East Tennessee, not too far from the beautiful Smoky Mountains. We put a lot of care & pride into "babying" our plants - ensuring that you get a top notch, healthy, beautiful plant that you can feel good about planting. It can be a lot of work, but we feel it's well worth it. During the spring/summer months, you can count on finding all of us ( sometimes the kids too ) out there digging, potting, planting, packing, pruning.....the whole nine yards. Even throughout the cold winter months, there is much to do "behind the scenes" to make sure that crops are produced, maintained, and cared for in order to keep our large inventory ready to go come warmer weather. From propagation, to grading & shifting upcoming crops..........there's always plenty of work to be done year round here at the nursery!! We truly enjoy what we do, and getting dirty is just part of a good days' work around here. I'm sure many of you out there can relate to this - you enjoy "playing in the dirt" just as much as we do. All the plants listed on our site are in stock and ready to ship unless otherwise noted. Each variety and size available has its own page with pictures of the plant that is very true to the size, and condition of the plant you will receive. We also list avg. shipping sizes for each & every plant we offer. No surprises like with some online nurseries. We have always felt that if we wouldn't buy it....why should we expect anyone else to. We also try very hard to provide our customers with plenty of photos for most every variety we offer - photos of representative specimens that our customers can expect to receive, as well as assorted other photos ( foliage / bloom close ups, mature specimens, different planting examples, etc ). We make every effort to provide you, our prospective customer, with plenty of information, facts, photos, and choices to help make selecting just the right plant for the right spot in your landscape as easy as possible. Even with all the pics & info we try to provide, you may still find yourself with a question or two that you need some help with, in which case we want you to feel free to send us an e-mail with your questions and we will be glad to help you with any additional questions you may have about a particular species / variety. You can also check out our Frequently Asked Questions page, where you will find helpful answers to several commonly asked questions. Once again, welcome to Evergreen Nursery........and "happy planting"! Robusta Green is a dense columnar juniper with scale-like green foliage with a hint of silver / gray to it. Takes on a twisted, very upright columnar shape with age. Great choice for accents, as well as borders - very elegant.